Good morning sweet friends. I know I have been scarce this week but guess what – today is Day of Giving Friday!! I’ve been busy behind the scenes and next week I’ll have some things to show. If you’re not sure what Day of Giving Friday is, be sure to go to my FAQ page from the top menu and scroll down to #11. Remember, it is open to my international friends as well. Be sure to check my Giveaway Winners page tomorrow to see if you are the winner. Day of Giving Friday Comment: What is the biggest gift you’ve received from crafting? In the meantime thanks to all who helped to locate the 7Gypsies ATC Holders several readers were looking for. You all are amazing! Everyone was on the hunt and here’s what I found out. Readers are finding these in stock at some Tuesday Morning Stores. Several can be found on Ebay. Corrina Neilson currently sold out. Hello Becca: What a gorgeous card, oh my goodness, it’s simply amazing, I hope I’m the lucky one this time around. Now, one of the best gifts I’ve gotten from making cards is the incredible people I’ve met along the way since I’ve started making cards just about 8 years ago, this group of fabulous and incredibly talented ladies have help me grow and be adventurous, trying out new things. One of this dear friends pushed me to get my new blog, which I started last December and now, through it, I’ve made even more friends. I love it. Such a beautiful card. Received my pearls! LOL and were ever so glad they were missing because I got another card LOL again!! Inside joke. Another beauty. Love you girl. Thanks again. One of my greatest gifts from crafting is watching the pleased reaction from the recipient when they open the cards. Several people have told me the cards they received over the years are still out “on the mantle”. My other greatest gift is my husband who really does not put a restraint on my buying – he knows that I will use the items. I am glad people found the carousel. I looked but did not find any – our Tuesday Mornings did not have any. What a beautiful card!! thank you for sharing. What I get my card making is lots of new friends and sharing. Crafters are some of the nicest and most sharing of folks around. Hi Becca, such a pretty delicate card. The biggest gift I have received from Crafting is so many new friends to share thing with and to have a good laugh whilst doing it. What a very beautiful Card, loving it,My biggest gift is to be able to look at blogs seeing their talent and getting to know friends who i have never met ,who can cheer me when i feel a little down or lonely . Crafting has brought me a feeling of self-worth. Becca, You do the most beautiful bow work. They are always just the prefect thing to set off a beautiful card. Love this blue one with the little floral accents. The biggest gift I have received from crafting is the wonderful creative people I have connected with. The joy of crafting from the smile or tears from a receiver of your creative gifts to the memories created along the way. It’s an awesome journey. Almost fourteen years ago I was one of the charter members of a local stamp club. We have met once a month since then. The friendships that have been forged have been such a gift plus the joy our card making brings to others. Beautiful card. I’ll be having a birthday in a couple weeks. This would be a wonderful present to give myself. The biggest gift I’ve gotten from paper crafting is meeting new people who share the same interest as I do. We get together to work on projects, demonstrate different techniques, and learn about new products. We become friends who care for each other in times of need or tribulation. What a lovely card and color combo.The biggest thing I have got from crafting the lovely crafters I have meet and so willing to share and help, also the compliments I have got about my cards.Would love to win this card. So pretty and I love the colours! So pleased you have found some Carousels too …..thank goodness for the Internet! My greatest pleasure from crafting, is when someone likes my cards so much, they keep them in a box! That is such a joy to know I have made them smile! As lovely as always, Becca! The most important thing I have learned from crafting is patience. Wauw once again you´ve just made such an amazing piece of art here Becca. I just absolutely LOVE todays card too. It is soo beautiful and well made in any way. Kudos to those ladies who were able to help you out finding those carousels! Woot, woot! The biggest gift from crafting is two-fold for me. First, the camaraderie from being able to craft & socialize with my friends at the club I belong to. Fun sharing ideas & techniqes, tools, & having help when needed. Gorgeous card, absolutely love the looks, this card just screams girlie!!! From the soft colors to the beautiful bow, the pearls and the gorgeous dies, oh my, anyone would just love to have this beauty arrive in their mail box!!! I saw I was the winner last Friday, Thank you! I am giddy just with anticipation of my mail arriving! I’ve sent you my snail mail info through your contacts! Once again you made this small town girl in Central WA one happy camper this Friday!!! Lovely card,Becca. Your talent holds me in awe. I appreciate your sharing of your creations to inspire me. Being able to share my love of crafting with others. Hi Becca, Beautiful and timeless–a chance for me to pull out my older dies and patterned papers to mimic your creation. Thanks for another great design. My best friend! And along with her came my husbands best friend!–her husband! Crafting has given me such peace of mind. 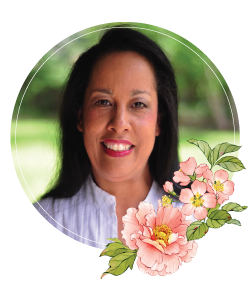 I was a caregiver for both parents and my husband at the same time. When I go into my craft room, a calmness comes over me and the only thing on my mind is creating something beautiful for somebody. I think the greatest gift for me was one time in another card making community. I was having a hard time with my health issues getting worse and I mentioned that I was going to have to quit making the cards because I was out of money for anything at all which is where I am still sitting. The whole community came together and sent me pretty printed digital stamps, a lot of pre – stamped images and quotes along with various embellishments and papers, cardstock and ribbons just so I could keep entering the contests in hopes that I could win some of the prizes, too. That just really touched me in such a deep way that it touched my soul.– To know that I am truly cared for which I needed to really know as my biological family disowned me and want nothing more to do with me whatsoever. The biggest gift I have received from crafting is a booster shot for my creativity. I am now willing to try things and I see possibilities where I never would have done so earlier. 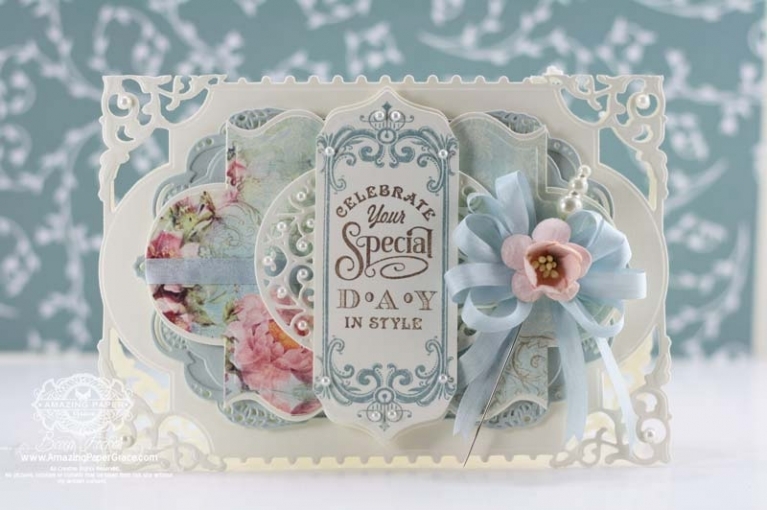 Beautiful layering Becca…your cards are always such an inspiration!!! Thanks for sharing! Wow…amazing readers who found those carousels for all of the rest looking for them! I will be checking out my local Tuesday morning! And what a beautiful card to share this morning, Becca…so pretty. Greatest gift…toss up between the smile on someone’s face when they see the card I’ve planned especially for them, and the one or two people I see who I’ve done some “passing along” a bit of trade craft with..as they become more and more impassioned with what it is we do. Hard to beat either of those two. So many great things come from your blog……like friends helping friends. Kudos to you Becca! Your card is Gorgeous with a capital G. Thx for sharing! What an absolutely stunning card, Becca, just gorgeous! The greatest gift I have had from crafting must be all the hundreds of people I have met, both within my own community and on cruise ships where I am fortunate enough to teach craft. I just love it! Biggest Spiritual Gift from Crafting: The gratitude that people have expressed upon receiving one of my handcrafted items has widened the channels of my heart and I have felt loved. You make Fridays EXTRA special – I really look forward seeing your beautiful creations and reading everyone’s comments! It is such an honor when people generously share how much they enjoy my cards and cherish them – they display them or place them with treasured keepsakes. What joy! The Biggest gift I have received from Crafting is “The Joy of Giving” Thank you for all of your Beautiful Inspiration and Creations and for being so Special!! The biggest gift I receive from crafting is the enjoyment of others from what I made. Beautiful card Becca. The biggest gift in crafting I have been given was when a stranger came up to me and commented “Oh you are Annamieke!” I asked why and she said she had been given one of my hand made cards. This was when I had faith that I could sell my card at markets. Alas my faith was unfounded. And I couldn’t even cover my cost for the markets. It seems that people are not prepared to purchase a handmade card for a price cheaper then a commercially mass produced card. So I stopped having a stall at a market. So now I just make cards to keep occupied. I am sorry Becca for losing my faith in selling my craft. Morning Becca Oh I just love this card, the biggest thing I have received from crafting is the many friends I have made all around the world, But also many in my own backyard that I craft with. Today’s card is so pretty, Becca. Love that French blue! So very feminine and elegant. Thank you for the inspiration! This is beautiful. I’ve received the gift of peace of mind. Oh Becca! Your card is just fabulous! You wow me every time I come here! The answer to that question is very easy for me today because, guess what the postman brought me….???!!! I never dreamt that one day I would be holding my very own Becca creation, but today I was blessed with not just the most gorgeous card, but a HANDWRITTEN note too, complete with a stamp of authenticity! Hi Becca!This card is stunning!I love the color scheme and intricate details. So elegant and gorgeous design. I love this gorgeous blog with my fave colors. One of my greatest gifts from crafting is when I make someone surprised and smile when they get their mail and they see the card. Having the ability to still be able to craft while in a wheelchair is a blessing. I you I love giving to others. Thanks for the inspiration. Hi Becca, I have to agree with some of the other comments that the joy of hand making a card for someone special in your life is so rewarding. Oh Becca this card is just glorious – love blue and white and the pop of pink in perfect. The biggest gift i have received from crafting has been my sanity – i.e. relief from stress and being able to release the gift of creativity that I have been blessed with. Oh, and lots and lots of bloggy friends! Good morning Becca, wowza simply stunning!!! The best thing I get from crafting is like most other crafters the way everyone is willing to help, share their knowledge and gift of giving knows no bounds!!! The best gift I received from crafting. The wonderful girls I have met thru stamping. I have made life long friends & the other thing is the thanks I receive from the missionaries most do not receive any mail at all not even a card for birthday or holidays. I have thought of stopping but they have beg me not to stop. Hi Becca missed you this week nice to have you back ! Lovely card pretty colours I don’t use blue much even though I love it. are some wonderful people in this world . This beautiful card reminds me of the biggest gift in crafting that I’ve received, that of bringing beauty and encouragement into others lives, simply by serving them with my handiwork. What a privilege to encourage others through the written word..via a handmade card. This is just an amazing card, Becca, so soft colors and elegant style. Morning Becca, A beautiful card, lots of lovely die-cuts and a very pretty flower and bow. You have some very ‘eagle eyes’ followers, finding the ATC holders, well done everyone. That is such an easy comment to make, FRIENDSHIP & LOVE. I have gained so much from the people that I meet at card making and scrapbooking events, a true Sisterhood. I have met many gals in the cyber world and then have met and talked to them in person, including you my dear sweet friend at CHA in Chicago about 2 or 3 years ago and what a pleasure it was that day, I have grown so much love inside myself from all of these wonderful Sisters, it truly is the the GLUE that sticks us together. The sharing of their crafts and are so free in giving you info has to how something is make or where to find the info or who to follow. I am so glad to have gained this in my paper crafting. I know I will be needing this for the years to follow as my sweet hubby of nearly 48 years has early Altzheimer’s, he is 75 and still teaching at the University, but this will be his last semester as he know he can not lecture the spring semester, last year it was the most difficult time he has every had and that when we realized that we needed to find out what was up. So we are taking this one day and a time and planning for the future as too what will make it easier for him here at home. So I will be going on my cropping and retreats with my “sister” for as long as I can and then when I can’t I will always know that I can find the love and friendship right here in cyber world. Thank you all my dear “sisters” for you love of sharing your work! Gretchen you are a treasure your husband is so lucky to have you! Wishing you well in the years ahead one day at a time . Beautiful card Becca, I would have to say the greatest gift would be the friendships I have formed over the years with other crafters.And the joy of knowing the recipient is grateful for the time and work but into their gift or card.